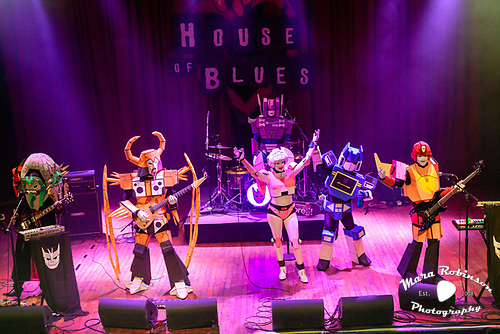 Sure, you’ve seen your share of concerts in your lifetime; but have you ever seen a concert put on by honest-to-god robots? Cuz we just did. The Cybertronic Spree was formed by Autobot Hot Rod along with a few fellow Transformers. 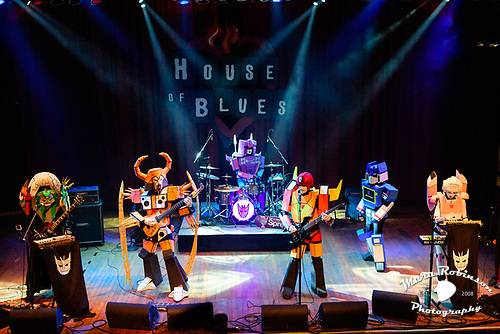 Friday night at the Cleveland House of Blues, we had a party of six: Hot Rod (bass, vocals), Arcee (keys, vocals), Unicron (8-string Korn guitar), a Quintesson (keys, guitar), Rumble (drums), and Soundwave (dancing, hype). “Rumble is a challenging bot, being from the Decepticons; but he likes to hit things, so that works as a drummer,” said Hot Rod in our interview. The Cybertronic Spree’s spaceship crash landed in Toronto, Canada a few years ago. Now, I don’t know what’s in Canadian water, but they’ve got it goin’ on up there. Maybe it’s the universal healthcare. Except robots don’t need healthcare. Anyway, Canadian rock music is just so much better than what they deem popular here in the U.S.
Sloan > pretty much everybody. 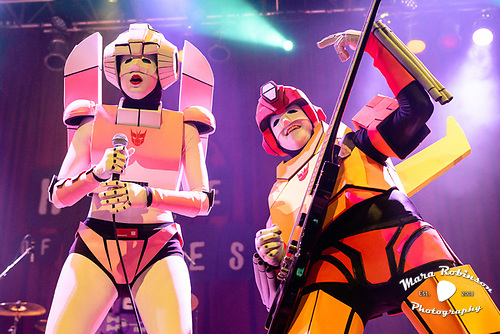 Even Transformers covering ’80s cartoon anthems do it better. 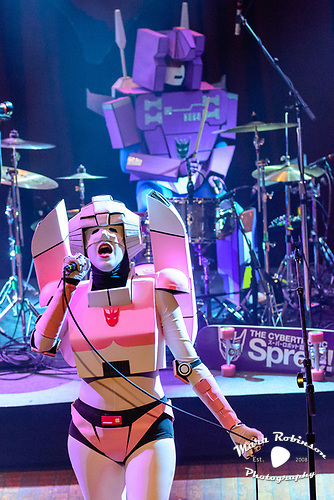 Initially, The Cybertronic Spree formed for the purpose of performing a single one-night-only live performance of music from their “1986 documentary The Transformers: The Movie.” Tonight, after taking the stage one-by-one, the band opened with the movie’s theme song. 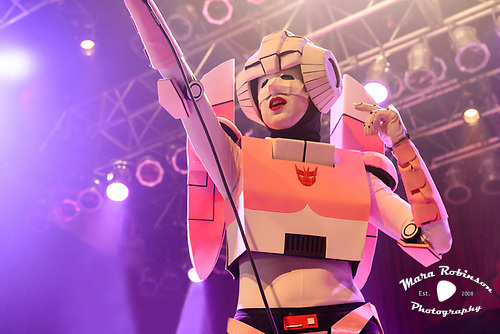 “HELLO, CLEVELAND!” Arcee shouted in a faux English accent. If I had a nickel…. 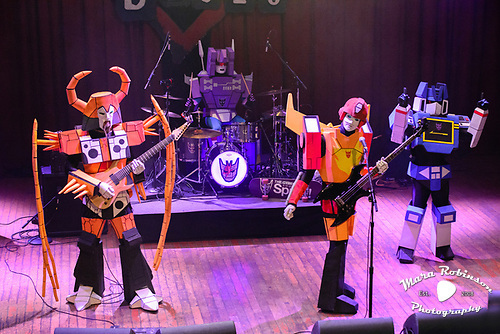 But The Cybertronic Spree took the Spinal Tap reference one step further, realizing their long-held dream of performing deep cut Christmas with the Devil on a Cleveland stage. “We’ve always wanted to do this,” she admitted. Lack of a Lamborghini Countach didn’t stop the band from taking on David Hasselhoff’s True Survivor from Kung Fury; although the branded skateboard aside the kick drum could have come in handy there. Limitations of live performance, I suppose. Two-seater sports cars just aren’t practical band transportation. Besides, why blow $200k+ on nostalgia when you can transform into a Dome Zero-inspired ride?! 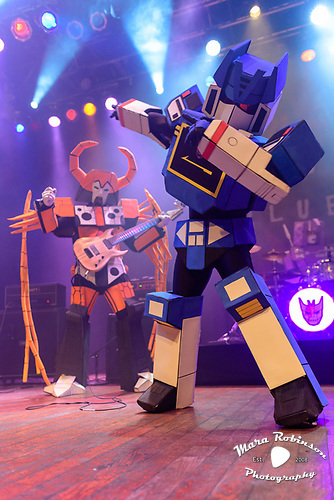 As Hot Rod introduced the Thundercats Theme he quipped, “I love those cats, but they need more clothing,” which was Soundwave’s cue to toss a few free T-shirts into the audience’s upraised hands. 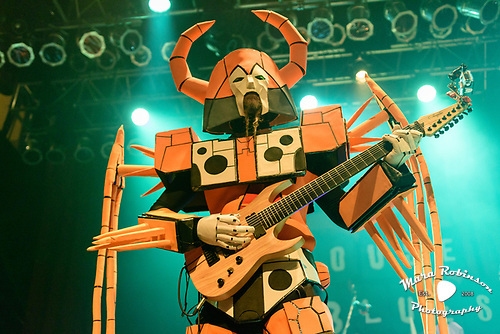 Then Hot Rod announced it was “Time to bring out the big guns” tying in something about Thor Ragnarok, as Arcee took center stage to sing the hell out of Led Zeppelin’s Immigrant Song. That bot can blow. Hammer of the gods, indeed. Then the band announced it was time for “a song about exceptional people from an exceptional place,” launching into the opening theme from the animated X-Men TV series, mashed up with the Spider-Man theme. 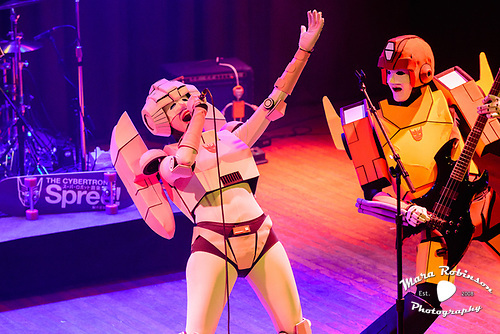 Arcee took center stage once again for Wheels of Fire, a Cybertronic Spree original “driving song for those who don’t look back.” Their other single, Cybertronic Warrior, complements the feel and positive energy of the other ’80s pop-metal anthems they play. The Cybertronic Spree doesn’t mess you around. They don’t even leave the stage before an encore. “It’s inefficient!” declared Hot Rod. “We’re robots; we’ll just power down on stage until applause fills our energy meters.” The bots slump over at the waist for a few brief moments, before powering back up to close the show with the musical acrobatics of Vince DiCola’s Autobot/Decepticon Battle and the Ghostbusters theme. All told, The Cybertronic Spree puts on a fun show. Take my comics-and-cartoons-loving ’80s-child husband’s word for it. He calls it “An incredible spectacle and impressive performance. An all-around great stage show and uplifting, positive rock experience.” He adds, “If I was a kid and saw this show, my mind would be blown. 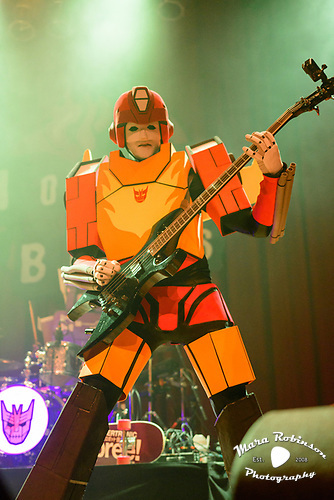 It’s hard not to have a good time when you’re watching robots shred on stage.” True dat, Jason, true dat. All concert photography by Cleveland music photographer Mara Robinson.